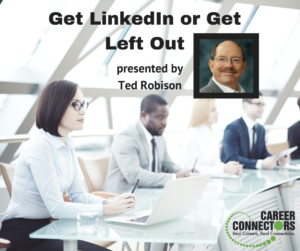 2/28/17 – Get Linkedin or Get Left Out! Ted started his work life in nuclear engineering and jokingly says that he coaches now to atone for his nuclear-related sins. His journey to becoming a LinkedIn coach is a fascinating one; if you have a chance to talk with him, be sure to ask him about it. 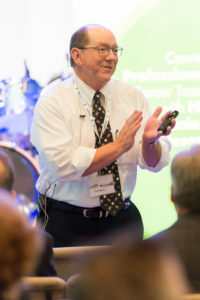 He’s a passionate and humorous individual, dedicated to coaching others about LinkedIn. Get Linkedin or Get Left Out! Do you want to get found by recruiters? Network with people in your industry? Find out information about the companies and people you’ll be interviewing with before the interview? LinkedIn can help you do all of this and more. Many recruiters and hiring managers use LinkedIn exclusively; if you don’t have a LinkedIn profile, you’re missing opportunities. Use a professional headshot as your photo for 14x more profile views. 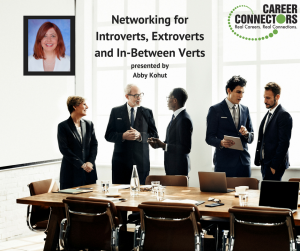 Your headline should have your current job title; consultant or volunteer is a viable title (here’s where I put in a plug for volunteering for Career Connectors!). Because LinkedIn uses keyword density, be sure to fill out your profile with as many keywords that pertain to your job search as you can. Your summary should contain skills (hard and soft), experience, expertise and major accomplishments, and style. Style includes: your brand/wow factor, what value you bring to the company and how you differentiate yourself (e.g. problem solver, customer advocate, walk-around manager, etc.). You should belong to 30-50 groups on LinkedIn. Join groups and associations that are part of your target market, personal interests, professional associations, school alumni associations, or prior companies. Go to group meetings, which might require some perseverance. The hidden job market comprises approximately 80% of all jobs. To tap into the hidden job market, create a list of target companies, build relationships at these companies and follow the companies on LinkedIn. One way to create a target company list is to use the Book of Lists from the Phoenix Business Journal. To prepare for interviews, research the interviewers on LinkedIn. Knowing their hobbies, jobs and groups can help you connect with them during the interview. Research the company – product, services, competitors. Do informational interviews to determine if the culture is a good fit; do my values match with the company’s values? Know your value prior to the interview. Intel’s vision: if it is smart and connected, it is best with Intel. In the last 6-8 months, Intel has changed its entire strategy to a virtuous cycle of growth revolving around memory, the cloud and data center, FPGA and things and devices. Intel invested $7B to finish Fab 42, which will create 3000 – 10,000 local jobs, including subcontractors and support services. The majority of the roles are technically inclined, but not all of them. Do your research and fit everything in the job description before you apply. No spaghetti recruiting here. Sonora Quest is a joint venture between Banner Health and Quest Diagnostics with 3100 employees in Arizona. Using the 6 Sigma method, Sonora Quest’s goal is to provide the best patient care by partnering with physicians and focusing on preventative care. Their benefits are the same as Banner Health. Openings include CRM Systems Analyst, Desktop Engineer, Emergency Management Coordinator, Customer Systems Analyst Sr, Information Security Analyst Sr, Laboratory Manager, Operational Excellence Manager, Strategic Sourcing Director, Medical Lab Scientists and Phlebotomy Leadership. Ajilon and Accounting Principals are not your typical temp agencies. Located in the east valley, these two branches are the second best branches in the US! Accounting and finance job seekers should talk to Accounting Principals; administrative, logistics and supply chain job seekers should talk to Ajilon. Parker and Lynch is the executive branch encompassing both. Accounting Principals is looking for a candidate with commercial collections experience ($42K-$45K/year), as well as vendor administrative support ($38K/year). Ajilon is looking for a professional inventory associate ($18-$20/hour), an account manager ($20-$22/hour), and a closing call center supervisor ($18-$20/hour). Freedom Financial Network is a debt consulting company that provides financial solutions and services to enable consumers to achieve financial freedom. Their 3 AZ locations have 1300 employees, and have hired 200 of the 1000 individuals they want to hire this year. They are in the process of building a new campus in Tempe and were recently named as a Phoenix Business Journal “Best Places to Work” Winner. Open positions in Tempe include Java Developers, Product Managers, Corporate Trainer, Compliance Manager, Business Intelligence Analyst, Negotiations Debt Settlement Specialist, Inside Sales Reps and Software Developer. Next event in Phoenix: “Use LinkedIn in 15 Minutes Per Day” on Wednesday, Mar 08, 2017 9:00 AM to 12:00 PM, due to February being a short month. Register here.